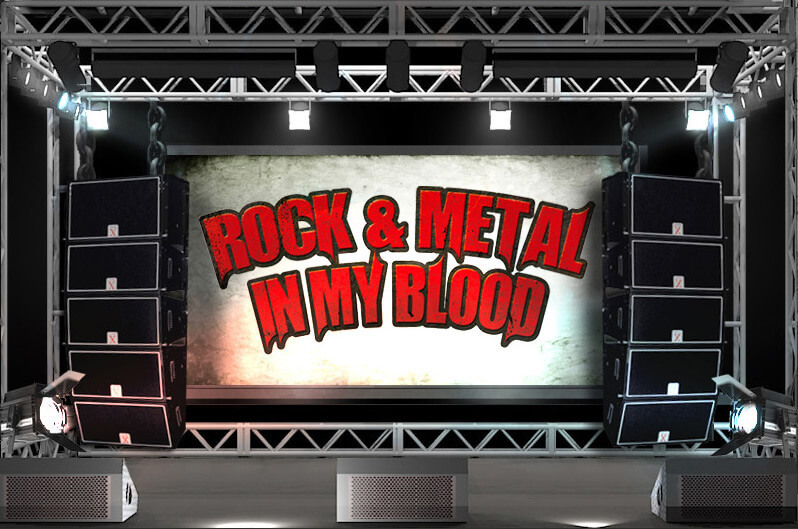 "Rock & Metal in my Blood" has the pleasure of presenting you with an exclusive interview with drummer Sid Falck. It's an honour to have been granted this interview by a true thrash metal veteran, a man of dignity, strength and the will to overcome every obstacle. Currently dealing with health problems, Sid is continuing his battle like a true metalhead, with strength, determination, tenacity and persistence. In fact, nothing will stop him from succeeding with his new project Infectus 13. We had a long chat during which Falck talked to us about his time in Overkill, Paul Di'Anno, the present and his future. R&MIMB: Let's talk about your new band, Infectus 13: what made you decide to start this new project? SID FALCK: Well, I had been retired from playing for about 15 years, and of course, people always asked "are you ever going to play again" and my answer pretty much always was.. maybe some day. On December 23rd of 2012, after not having felt well for months, I was on a trip to Phoenix , AZ, and somewhere in the middle of nowhere Texas, I got really bad and was put in the hospital with unspecified heart related problems. I was diagnosed with severe Atrial fibrillation. And between March and June of 2013 I had 2 heart surgeries, and was told the problem hadn't been fully fixed and to expect the unexpected. So all of a sudden, I had to come to terms with the fact, that I might not have "some day". So after a lot of soul searching and talking to a couple of really close friends, I decided that I should try to at least record one more album. Hence the name Infectus 13 (The infected 13) because I decided to give it another go at the end of 2013. R&MIMB: The Single "Enemy at the Gate" sounds powerful and intense. What can we expect from the complete album, "Last Rites"? Have you got a release date yet? SID FALCK: Well the whole album will be heavy, that much is certain. Enemy at the Gate is a pretty good representation of what it will sound like. However, I will say that we have stuff that is slower, but we also have a couple of songs that's all out thrash with a little twist. So, while it will hopefully have a little bit of everything, all of it will be heavy. As far as a release date, I've learned my lesson and it will be released when I think it's ready lol. Originally, based on past experiences, I figured 6-8 months to write and record was very realistic. But this is not the old days. This is a group of people who have never worked together, and who have very different musical backgrounds and experiences. So, it's taken much much longer than I anticipated unfortunately. The fact that I keep wanting to redo songs to, in my opinion, become much stronger, hasn't helped. But believe me I'm becoming extremely impatient too. R&MIMB: How did you meet the other guys in the band? Are there any anecdotes you can tell us? SID FALCK: Well, Bob Barnak I met through Dave Linsk of Overkill/Speed Kill Hate. Bob works with SKH, and I became a big fan of his vocals, so he was the first person I asked. He's very very intelligent and talented. Shawn Sanders comes from a very different type of metal background than me, and originally was only helping me write. But after a while, I felt it was a bit unfair to have someone help with ideas, but then have someone else record the songs. So one day, I asked him if he was at all interested in being part of the Circus ,and almost before I had finished the question, he said yes, lol. Steve Pogue came in right when we were getting ready to finish up tracks for Enemy, Janna, the original guitar player, had prior commitments and was unable to continue, so after talking to Shawn and our friend Kelly (who has been trying to coordinate everything) Steve's name came up. He auditioned by pretty much being put in the control room and told to come up with 2 secondary guitar tracks for Enemy on the spot, which he did, so he was an easy decision. I've worked with a couple of different bass players. Eric Rose was the first bass player I worked with. He played on the first song we released, a cover of Paint It Black. Eric was very much into it, and a great guy and a great bassist. Unfortunately, at the time, he was involved with 3 other projects I think, and I just felt that there wasn't enough time left over for what I needed, time wise, for Infectus 13. I then asked Andrew Guthrie, one of the funniest guys you can be around, if he would be interested, explaining up front, that we're doing things in an unconventional way. Instead of writing 12-14 songs and recording them, we write and begin recording drums, bass and at least scratch guitar, one song at a time, otherwise we'll completely forget everything that needs to make that song great, because we're rarely in the studio at the same time. Unfortunately again, Andrew is involved in about 12 bands, and unfortunately I just had to make the decision, that between Shawn, Steve and a friend of ours, we'll get bass tracks taken care of. At this point we have , I think, 8 songs I'm very happy with, so we have another 3, 4 songs to go. R&MIMB: What will you do to promote your music? Do you plan to tour? Are there any more projects on the horizon? SID FALCK: I don't know for sure yet. To this point, I haven't talked to any labels, so as to retain full control of the process. Typically, the label promotes the product. But this isn't the same business that I left back then. When I feel we have the product ready, I will start seeing if anyone is interested in releasing and promoting it and go from there. As far as touring. I don't see us doing the conventional tours. It would just not be feasible health wise for me. Having said that, I'm certainly open to the idea of doing special shows if some established name was to ask us to open a handful of shows, for instance . And sure, we've talked about possibly looking at the festival circuit, especially overseas. But it's all a bit premature lol we need to finish this, in order to have songs to play lol. R&MIMB: You started out with Overkill during the most successful period for the band. How did your entry contribute to the success of the band? SID FALCK: Hahaha I don't know that I could possibly answer that question without sounding extremely conceited! I think that Rat was without question, a very original drummer, and when he heard a riff or a part, there was no telling which direction he would take it. He seemed to be very much influenced by punk, where excitement and spontaneity rules. I, on the other hand, came from a very traditional hard rock / metal background. I was very disciplined in my playing, and perhaps even somewhat predictable. So, and I could be wrong, but I think that maybe although I could do things people wouldn't expect, at the same time maybe I helped make the songs a little bit more organised and in general more approachable for people who might not necessarily have been life long fans of thrash/power metal, I really don't know. I think that's truly for other people to judge. R&MIMB: How were you recruited by and where was your first audition with Overkill? SID FALCK: Well, Battlezone's American tour manager and LD, Rick Lathrop, also served in the same capacity for Overkill. So when Rat left and they had finished their tour commitments with stand in drummer, he suggested to them that they should check me out. So around November or December of '87, Blitz asked me to come to NYC to give an audition a shot. At the point, all my equipment was in London and I was staying with friends in upstate NY. So besides just listening to the handful of songs he asked me to become familiar with, I actually only got to physically play the songs once, on a borrowed drumkit, on Tim Mallare's kit actually. They must have liked what they heard, because at the audition they played the riff for what became the song "Shred" and basically most of the stuff on the first half of the song, I came up with at the audition. R&MIMB: You had the chance to play on three wonderful Overkill albums. Which one is your favourite? SID FALCK: Again lol, how can I answer that? From a personal performance point of view? I don't like my playing on Under The Influence. I had 8 weeks total to learn a new genre, learn the songs etc, and truthfully, even to this day, I have a hard time listening to the drums on that album. Great songs, poor drumming. The Years of Decay had amazing songs, and I had become very comfortable with the style of music and how I heard the riffs etc. So it was a completely different experience to actually be able to contribute to the writing process and the recording was relatively easy. I think it was an album Overkill HAD to write at that point in time, and to this day, it's still a fan favourite. Again, from a personal performance point of view, I think that Horrorscope probably contains my best playing. It was definitely a different process, writing especially. But I think both performances, production and material wise, that album is a great album. To this day, I still find myself trying to analyse what I did, how I heard the parts etc. All three album have great songs on them, so for me it really comes down to my own performance on each. R&MIMB: On "Horrorscope" Overkill changed from a four piece to a five piece band. In your opinion, how did the sound of the band change with the addition of a second guitar? SID FALCK: Well, it was obviously a completely different vibe writing it. But I think, the biggest difference was live. Having a rhythm guitar under the lead did obviously make the songs sound much more like they sounded on the albums. R&MIMB: The band introduced Chaly on the cover artwork, what change did this bring to the image of the band? SID FALCK: Ahh, Chaly lol I don't know that it brought a change to the image of the band. I mean, Chaly had been around since the birth of Overkill, since 84, so it was not like introducing a new element. Making Chaly the center piece on the cover of Under The Influence, certainly opened up new possibilities for artwork in general on albums and merchandise and such. I think more importantly, featuring Chaly in the Hello From the Gutter video, was genius and innovative. Maybe even a first? R&MIMB: What contribution did you make to the writing of the Overkill albums? SID FALCK: On Under The Influence very little haha. Songs like Drunken Wisdom, End of the Line, Overkill 3, were my suggestions as far as how to play them. The rest, I had to rely a lot on the other guys to steer me in the right direction when I veered off track. On The Years of Decay, while certainly there were times DD or G would say "hey, I'm kinda hearing something different for that part" and we would try their way out, sometimes with success, other times not, mostly I think they had come to the point where they had enough faith in me to take the ball and run with it. Besides the drum parts, mostly I would make suggestions concerning arrangements. On Horrorscope I was a little more involved with the writing, primarily because it was a new situation for DD to be solely responsible for the writing. Again, I contributed more in the sense of, if DD was stuck on a part, I would say.. hey try this, or try going this way. Like, making him aware that there were other directions he could go in with ideas. Of course, Rob Cannavino came in fairly early on, and brought his own ideas and perspective to the table which had a lot to do with how the album came out. R&MIMB: Do you have any funny stories about your time in Overkill? SID FALCK: Many hahaha. Despite what people may think, or have heard, 95% of the time, we were just a bunch of friends having a lot of fun together, while getting to do what we loved. There are lots of drunken stories, like me waking up complaining that my back was killing me and Blitz telling me that the night before, I was walking around some town in Germany lifting cars by their bumper lol or while in Hamburg on tour with Slayer , how Tom and I got really really drunk and went into the hotel restaurant (where Overkill's manager was having a meeting with a record company exec) and Tom and I apparently started playing bowling, using the tables as balls and the chairs as pins. R&MIMB: How was it to work alongside two major producers, Alex Perialas and Terry Date? SID FALCK: Well, Alex I kinda knew before I even joined Overkill . He and I lived in the same town, Ithaca, in upstate New York. Alex obviously had a very solid reputation as both an engineer and producer. But, I think I did my drum tracks in 4-5 days, then went back to New York city, so we didn't spend that much time working together. Terry Date on the other hand, I spent a lot of time working with. He's a very smart guy, and quite often, he hears things completely different than the artist. He is also very good at judging if the artist is stretched to the max of their abilities and if not, he'll try to get a better performance out of you. On TYOD, he came to the studio we were writing at, about a week and a half before we were scheduled to start recording. And we actually did real pre production with him, which definitely helped everyone get familiar with each other. Which was good, because I think we spent almost two months together in the studio recording that album. Horrorscope was a very fast album as far as recording it goes. DD and I got to the studio with the crew and got everything set up and ready, and Terry flew in the next day, straight from another studio and we had him for a total of 28 days before he HAD to fly to Oregon to begin recording with Soundgarden, so it was very much "don't waste time, get to work". I recorded about 12-14 drum tracks in 1 ½ days lol. But I think that that is one of the reasons why that album has so much energy. We almost didn't have him, but somehow he reworked his schedule enough to be available for those 28 days, so obviously he must have liked to work with us as well. Although Terry was a known and respected producer and engineer before he became involved with Overkill on The Years of Decay, I do think that him working on that album with us, gave him.. I don't think credibility is the right word.. but it made other "thrash" bands want to use him. R&MIMB: In respect of Overkill's earlier material, before you joined the band, what songs did you enjoy playing the most when you joined? SID FALCK: I should be nice or cool and say all of them, shouldn't I? Hahaha but I won't go that far. I think songs like Rotten To the Core and Overkill 1 & 2 were probably some of the songs I enjoyed playing live. But songs like Hammerhead and Electro Violence and Wrecking Crew certainly was also fun. R&MIMB: Bobby Gustafson left Overkill soon after your entry. We know you are still in touch, tell us about your project Hail Mary with him. SID FALCK: Bobby and I have kept in touch over the years, and naturally the thought of doing something together again has been talked about on occasion. However, it seemed like the timing was never right for one reason or another. But last summer Steve (guitarist Infectus 13) and his wife Cheri, were on a charity motorcycle run with DBA (Downed Biker Association) which they are part of. Unfortunately, Cheri had an accident, and her left foot was partially severed. A couple of life flights, hospitals and surgeries later, unfortunately her left leg had to be amputated just below the knee. To cut a long story short, ?. Bobby had gotten to know Steve and Cheri, and around October of last year, Bobby and I were talking and he said that he had an idea for a way to possibly help.. what if he and I wrote and recorded a song together and donated all of the sales to Cheri? So after a few discussions about who else we could ask to be part of this, I suggested we ask John Gallagher of Raven, since he and I have known each other since the mid 80s. Luckily John said he wanted to be part of this as soon as I called him, and so the Hail Mary project was born. It took a little longer than we had hoped to get the song finished. The song it self was done around Christmas .. actually, the song we recorded was one of two songs we wrote, so we found out that we write really well together. But since everyone involved, the studios and engineers, donated their time free of charge, it's taken longer because we had to work around their booking schedules. We think that the song is really good (naturally) and we can't wait to get it out there, and hopefully a lot of people will be willing to buy the download to help us raise money for someone who needs it. It is scheduled for release on July 1st. Besides that, We'll have to see if this is going to remain a one time thing only. R&MIMB: Before Overkill, you played in Battlezone with Paul Di'Anno. What are your memories of that period of your career? SID FALCK: My memories are very blurry hahaha Paul is obviously a very good vocalist and although like everything else in life, we had our up and down periods. But my memories are mostly good. I think most of the problems that existed were due to people who worked with/for the band.. management, record companies and such. Everyone wanted to secure their part of the potential success, so in the end the guys in the band were pulled in every which direction. Other than that, we we're pretty much just 4 mates having a lot of fun the majority of the time. R&MIMB: How has music helped you through difficult times? SID FALCK: I think there are two different answers to that question. As a fan of music and bands, just like everyone else, when times are not so great, music is something that can help take you away from your present "place" mentally. Whether it's lyrics or notes, it can help take you to a different place. As a musician, music can give you something different to focus on and help you feel better about yourself or your situation many times. R&MIMB: Are you a self-taught drummer, or did you take lessons? SID FALCK: I'm completely self taught as a drummer. I took piano and guitar lessons when I was a kid, but never a single drum lesson. R&MIMB: Why did you decide to become a drummer and what is your ideal drum kit? R&MIMB: Finally, We were really saddened to hear about the premature passing of Nick Menza. Could you share your memories of him with us? SID FALCK: Like most, I was saddened to hear of his passing. Much too soon, as it has been the case with many artists the last couple of years. I didn't really know Nick personally, except us having run into each other on a couple of occasions. He was obviously a talented musician, and seemed like a really sweet guy. Always ready to chat and always seemed to care of his fans. So yeah, when something like this happens to a fellow musician, it does hit a bit closer to home. Especially if you, yourself have health problems. It makes you realise that you can't take anything for granted. Especially not tomorrow.